To miss a credit card payment is to be human, as the saying goes. 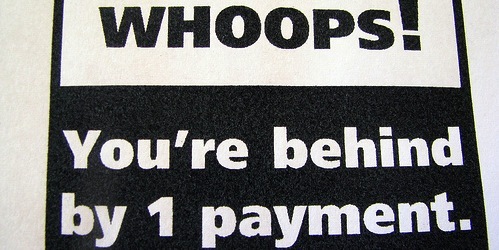 Okay, that’s not really a saying, but I think most of us have missed a payment at least once in our lives. For some, it’s learning a lesson, while for others it may just be out of necessity. Heck, there are times when coming up with just a minimum payment may seem impossible. But whatever the reason, it’s important to understand the consequences of missed credit card payments, which are perhaps the most commonly missed payments out there. When you open a credit card, you’re given a grace period in which to make your payment (minimum, partial, or in full) before a late penalty is applied. So you have your standard billing cycle, which is about a month, followed by another 20 to 25 days or so when you can make your payment penalty-free. During this time, you can make a minimum payment just to avoid any late fees, or make your payment in full to avoid interest (assuming you didn’t carry a balance the month before). If you don’t make at least your minimum payment within the grace period, you will be assessed a late fee, which is now capped at $25 unless you’re a repeat offender. This is pretty straightforward stuff, although it is recommended that you never carry a balance on a credit card with an APR higher than 0% to avoid unnecessary finance charges. Tip: When you open a credit card, contact your credit card issuer to ensure you’re aware of the grace period and how it works. Never assume anything. With credit card late fees on the rise and associated costs more severe, it’s now more important than ever to ensure you make timely payments each month. While conventional methods for paying credit cards still exist, such as snail mail and telephone payments, there is a much better method available today that is free, fast, and secure, and may help you avoid late payments. I’m talking about electronic payments, which you can easily set-up with your credit card issuer to quickly and safety send payments online from your bank account to any of your credit card providers. I prefer electronic credit card payments because they’re easy to execute, well documented, much faster than payment via the postal service, and don’t carry associated fees that often come with telephone payments. At the same time, I oversee each payment I make and steer clear of automatic Billpay for a number of reasons. You may think this tip is obvious, but I’m constantly amazed by how many people continue to pay their credit card bill(s) using traditional methods, with some even incurring fees to use the pay-by-phone option. It’s really quite simple to set-up electronic payments online, and there’s no good reason why you shouldn’t be paying this way. The Fair Credit Billing Act requires that credit card issuers send your statement at least two weeks before the payment due date, but it may take days to arrive. And once you do receive it, the more time you waste not sending in a payment, the better the chance you’ll miss a payment, which will result in a late fee and possible credit score repercussions. Not to mention universal credit default, which could quickly turn a 0% APR credit card into a credit card monster with APR above 30%. Let’s face it. It’s not fun making your credit card payment(s) each month, but why lick stamps and risk a late payment when you can point and click online and get things done in minutes. It’s enough that credit card issuers apply finance charges, so why let them hit us with fees for late payments, over-the-limit fees, and other penalties? Remember, credit card issuers won’t waste a minute penalizing you if you’re even a day late in making a payment. As mentioned above, missing your payment due date will result in a late fee, which while unfavorable, isn’t the end of the world. But where things really get nasty is when you miss two consecutive credit card payments. In other words, you’re about 30 days late on the initial payment. At this point, most credit card issuers will report your lack of payment to the major credit bureaus. And this is where your credit score will take a major dive. If you’re curious how much it will drop, take a look at this screen grab from VantageScore. As you can see, a missed credit card payment can lower your credit score anywhere from 60-90 points. For those with higher starting credit scores, the impact is actually slightly larger. Sound unfair? It’s only because the consumer with the lower starting score already has some level of badness factored in. In fact, a consumer with otherwise flawless credit would see the biggest hit from a 30-day late payment, whereas a consumer with existing delinquencies would see a softer blow. 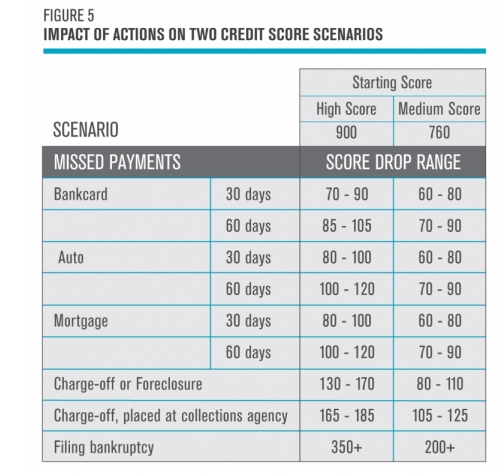 Using the VantageScore credit score range, which goes from 501-990, a 900 score could drop to 810. That would push you from their “A” bracket to the bottom of their “B” bracket, which is certainly a big hit. If you’re 60 days late on your credit card, expect the credit hit to increase to as much as 120 points. That’s as bad as a missed mortgage payment and in the realm of foreclosure impact. Ouch! 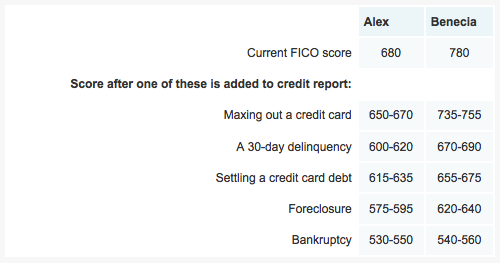 As far as FICO scores are concerned, the damage is pretty similar. A 30-day late payment results in a drop of anywhere from 60-80 points for someone with a 680 FICO score, and 90-110 points for someone with a 780 starting score. Tip: Maxing out a credit card can lower your FICO score as little as 10 points and as much as 45. On top of all this, missing multiple payments can also trigger default APR, which is considerably higher than standard credit card APR. Talk about sticking it to the consumer! And you wonder why people can’t get out of credit card debt. While this all sounds downright nasty, it’s not the end of the world. A missed credit card payment can sink your credit score, but its impact fades over time. It may remain on your credit report for seven years, but it should only affect your credit score negatively for about two years. After that time, it will still be present to prospective creditors, but it shouldn’t lower your score. The takeaway here is ensuring you make at least your minimum credit card payment every month. Otherwise, it can cost you money in late fees, higher APRs, and even via a lower credit score, which will make future financing more costly. So pay attention to due dates and grace periods, call your credit card issuers to ensure you’re on the same page, and create account alerts to make sure you never miss a beat! Tip: You can change your credit card due date if you want to pay on a certain date, or even set all your due dates to fall around the same time so you never forget a payment. So you’re saying I shouldn’t miss a payment…wow, didn’t realize it was that bad, thanks for the info! Previous Previous post: Serve from American Express: Prepaid 2.0? Next Next post: Introducing the Google Credit Card: Say What?